Weather: Climate was very warm (around 32 degrees) and very humid. On several days it rained at the end of the afternoon. Currency: Local currency is Riel and it is used for most small purchases. Hotels, restaurants and touristic activities are all charged in US Dollars. ATM's: ATM's for Visa are available is all cities. If you withdraw money with a foreign creditcard you can only get US Dollars from the machine. Creditcards: Widely accepted in hotels and restaurants. We always paid fuel with cash. 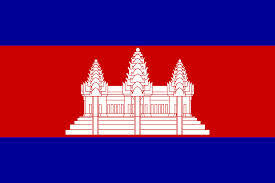 Safety: Cambodia is a safe country to travel in. Camping: Due to the very humid and hot climate we bushcamped only once, which was for free, and the rest of the nights we slept in hotels. Prices for a night in a hotel vary between 15 to 30 USD per room per night for two persons. Most expensive where the hotels in Siem Reap. Prices: In general Cambodia is more expensive than Laos or even Thailand. Visa can be obtained at the border. You need one photo for your application. Price for the visa is 35 USD per person. Entry: We entered the country at TKP borderpost (coming from Laos). Entry was quick and easy. We got our visa on this border and whole procedure was done in about half an hour. Extra costs = 2 USD or 20000 Kip for desinfection of the car. Our Carnet was stamped on entry. Exit: We left Cambodia at O'smach (going to Thailand). Exit procedures were quick and easy. Maximum 15 minutes and all was done. No costs. Most roads are sealed and despite some potholes here and there, general in reasonable state. Some parts however are really bad. 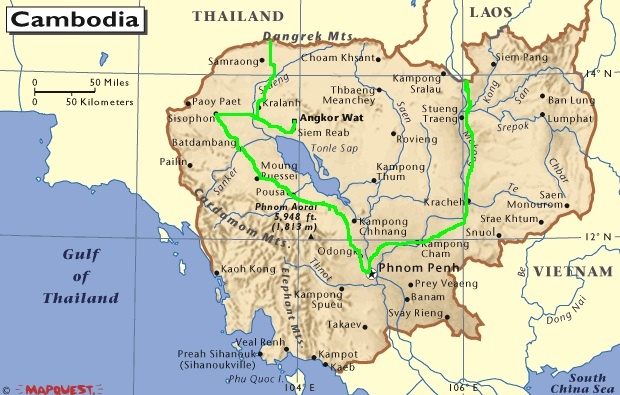 The worst road we drove in Cambodia was the stretch between the Lao border and Kratie. In some parts it looked like a war zone. Kratie, boat trip to the Irrawaddy dolphins: Costs = 9 USD per person. Although it is not likely to see more than some dorsal fins here and there we really liked this. Boat trips takes about one hour. Choeung Ek, killing fields: Entry fee = 6 USD per person. One of the largest kiling fields about 15 km outside Phnom Penh. The place is impressive and the Audio tour which is available is many languages makes the visit extra special. While walking around you can listen to some to many stories. Battambang, bamboo train: Crazy but fun train ride. Including a break the whole trip is about one hour. Costs = 5 USD per person. Battambang, Killing Cave and temple: Entry fee = 3 USD per person. Another place where the Red Khmer murdered a lot of people. Nearby is a temple with monkeys. Siem Reap, War Museum: Entry fee = 5 USD per person. The museum has a huge collection of weapons and former soldiers are guiding you around telling first hand stories. It was nice to visit. You can camp om the quiet parking if you want to. There is a toilet and shower. Phnom Penh: Nice city to visit. The city has very luxery restaurants but quite expensive. Siem Reap, Angkor Temples: Entry fee = 40 USD per person (for 1 day). There are also tickets for more days available. The temples are the most important highlight of the country and as amazing as we expected. Must sees are the Angkor Wat, Bayon and Ta Prohm. The last one is the one that is overgrown with huge roots. For us that was the most special one. In Cambodia they make great fruit shakes and most restaurants have good vegetarian choices. Mekong Dolphin Hotel in Kratie, luxury hotel with good parking. They have cheaper rooms at the back. 15 USD per room per night with wifi and airco. Shadow hotel in Siem Reap. Very nice hotel with small parking. Hotel serves breakfast, has a swimming pool and airco and wifi on the room. Price 28 USD per room per night including breakfast. Ta Prohm temple of Angkor. "jungle temple"